This post is sponsored by my local grocer, Harmons Grocery Store. The hot cocoa mix recipe and all opinions are my own. 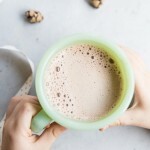 Did anyone else grow up with homemade hot cocoa mix? I distinctly remember sneaking a spoon into the oversized jar of hot cocoa mix for a mouthful of the sweet powder, this would then induce a big cough of sugary powder and thus evidence of my mischief. All worth it in the name of this seasonal treat. Of course, I did also, and just as often, ask my mama to mix me up a mug of this homemade blend with some hot water, which was equally satisfying. Everett is now at the age when my hot cocoa memories started and I wanted to give him that same sweet little blessing that is so warming in the cold months. When I started to look back at the recipe I decided to simplify it a bit and not use any unknown and artificial ingredients, especially knowing that he’d be requesting it daily if not more. So, I investigated a little and found some ingredients to get excited about. I found three simple ingredients at Harmons to blend together for this hot cocoa mix. 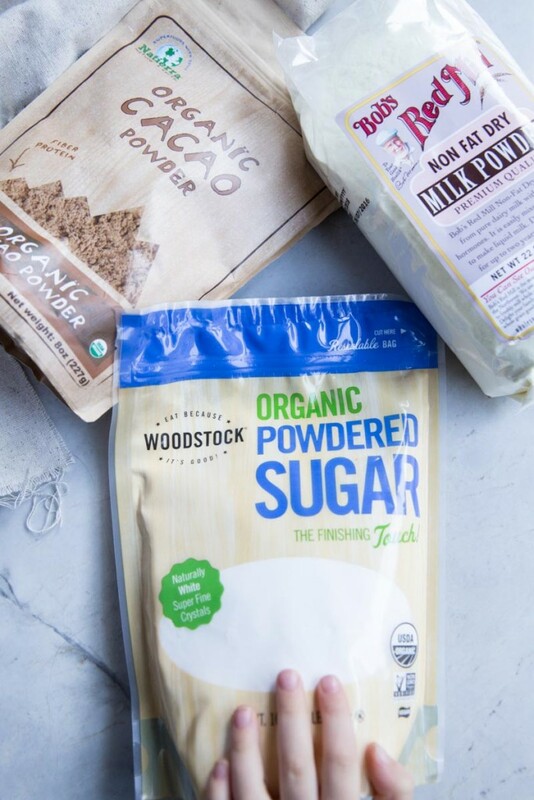 Organic Cacao powder (you may also use unsweetened cocoa), not fat dry milk, and organic powdered sugar. These three ingredients plus hot water, make for a magical winter-time drink that my whole family enjoys. 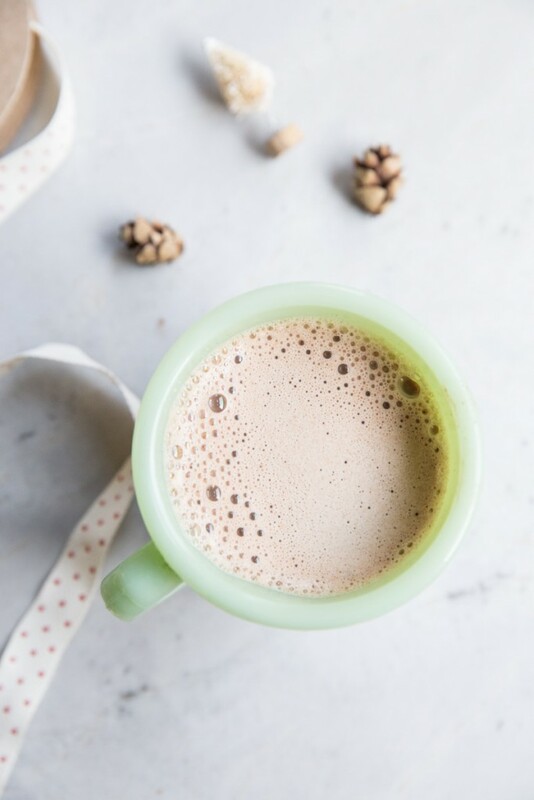 Cacao is a top source of antioxidants, and it contains an abundance of magnesium and iron. 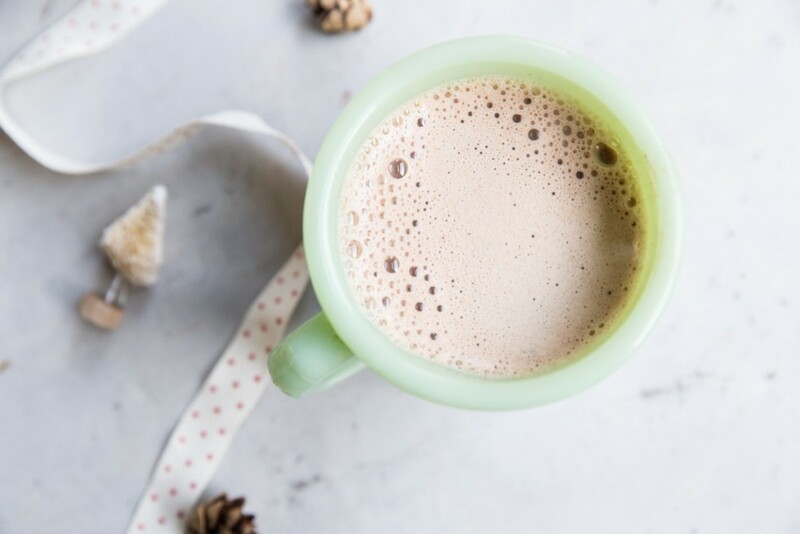 It makes for a perfect healthy alternative to conventional over-processed “cocoa” used for baking, hot chocolate, desserts, and smoothies. If you simply can’t find cacao, try looking for a organic cocoa that has few ingredients. I’ve found that Rapunzel Pure Organic Cocoa Powder works really well. Look for cacao or cocoa in the baking isle or coffee isle of your grocery store. As for the non fat dry milk, check the package for an ingredient list. I know I can always trust Bob’s Red Mill for the purest product. If you want to make a vegan version of this try coconut milk powder. And for the powdered sugar just make sure that the primary ingredient is organic cane sugar. 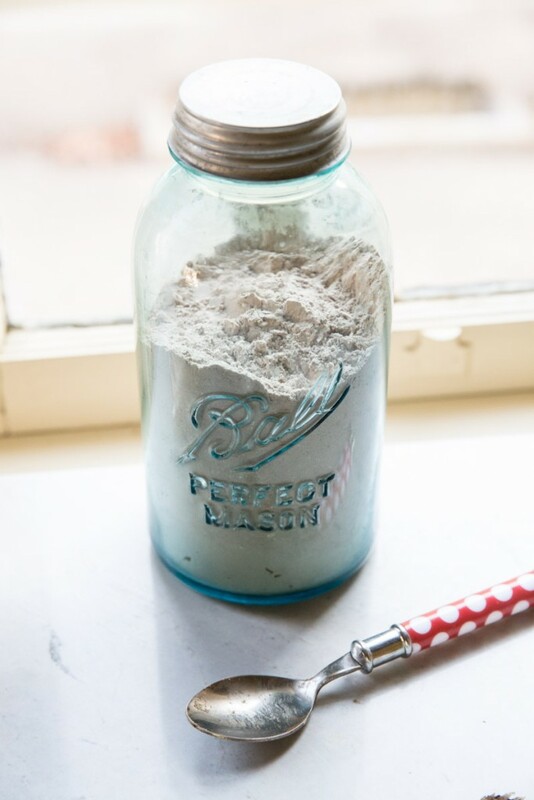 For a paleo version use coconut milk powder and coconut sugar or maple sugar in equal proportions to the powdered sugar. I remember taking a oversized whisk to the bowl for this job as a kid. Everett brought his own whisk and spatula for the job. You really can’t mess this up so let the kids use their growing muscles to mix together the cocoa. And if they get a taste or two during the process, you need not worry! The mix also makes a great gift that kids can give away to their friends. I do a ratio of 1 part hot cocoa to 2 parts hot water but my husband likes it 1:1. You’ll find your perfect blend but start there. Hot water is key to getting all of the chocolate to melt evenly, whisk to combine. You may then add a ice cube to the kids drinks but don’t try to mix with luke-warm water. If there’s a little chocolate sludge at the bottom, think of it like a little gift from above. 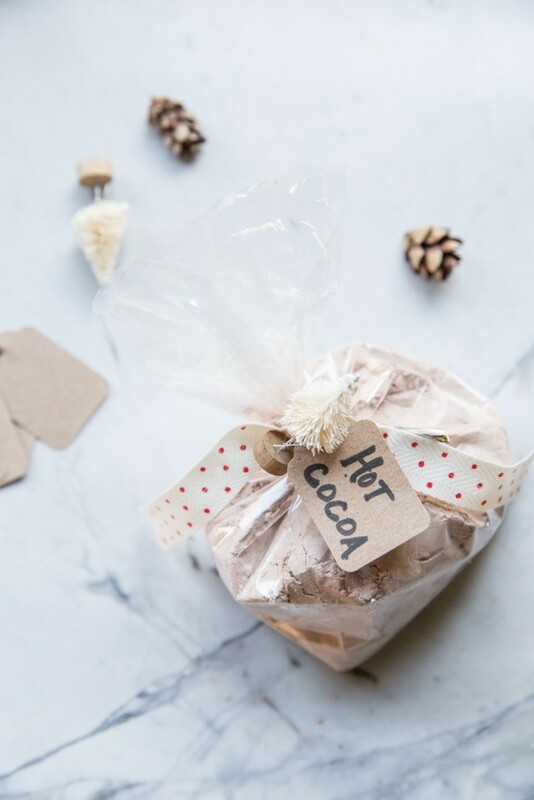 An organic, all-natural recipe for hot cocoa mix. 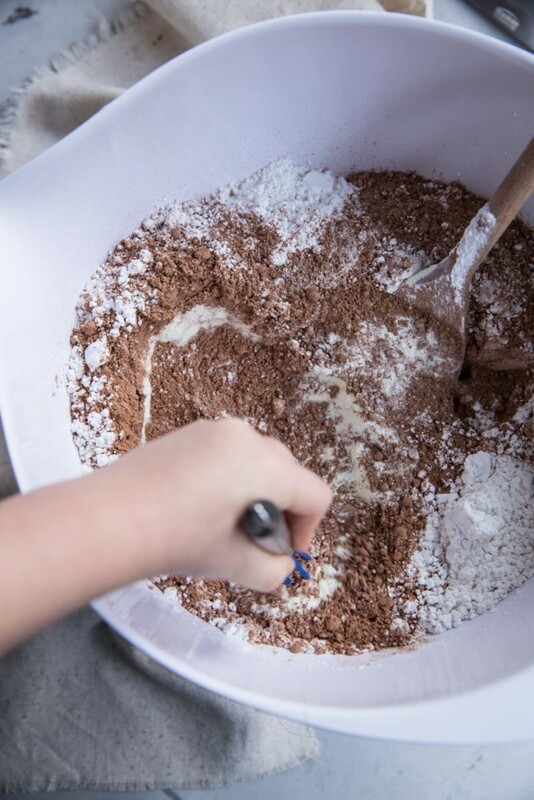 Add all ingredients to a large bowl and use a whisk to combine. Transfer to a large jar to store. This will last a couple months in a dry cool area. 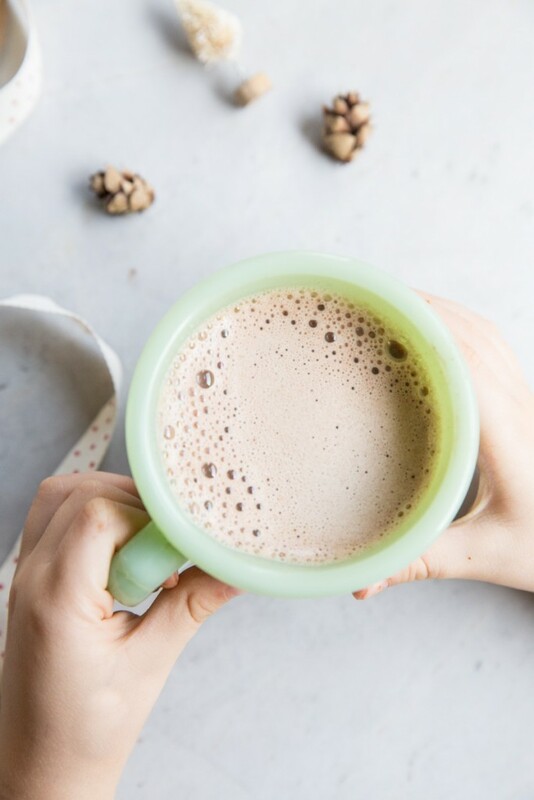 To make hot cocoa: Add 1/2 to 1 cup of hot water* to 1/2 cup of hot cocoa mix. Whisk to combine. You must use hot water to adequately melt the chocolate into a liquid. If servings kids, mix the cocoa with hot water then add an ice cube to cool it down. I have found that Rapunzel Organic Cocoa powder works really well in this. Becky, I make a mix similar to yours. Sometimes I add espresso powder. Not for kids but for grownups! I’m craving a cup right now!